Oh my word was this delicious! there is nothing more comforting than a big bowl of croissant pudding with a scoop of vanilla ice cream. Nothing. I’m thinking of putting this in the breakfast mix as well! Preheat your oven to 350F. Grease a medium sized baking dish. Cut the croissants and bread into cubes and place in the dish. In a bowl whisk the eggs and sugars. If you want you can just use white sugar, but using the brown sugar gives the pudding a butterscotch flavour. Once the eggs and sugar are completely mixed, add the vanilla, cinnamon, nutmeg and milk. Whisk until everything is combined and pour over the bread and croissant cubes. Let the mixture soak into the bread and press down to get the top pieces coated. Bake for about 40-45 minutes. Serve with vanilla ice cream and you will have a house full of happy people! This recipe can easily be made smaller. Just half all the ingredients. You can also use all bread if you want! It’s no secret that apples are one of the best things you fill pastry with, and buying frozen apple tarts and apple turnovers is the best thing in the world, but making them at home is so easy, that it trumps being able to buy them! It’s so simple and delicious and just, PERFECT, so I don’t feel the need to explain anything else. Let’s get to the recipe people, so you can make this just as often as I do. Here’s what you need to make the golden triangles from heaven. 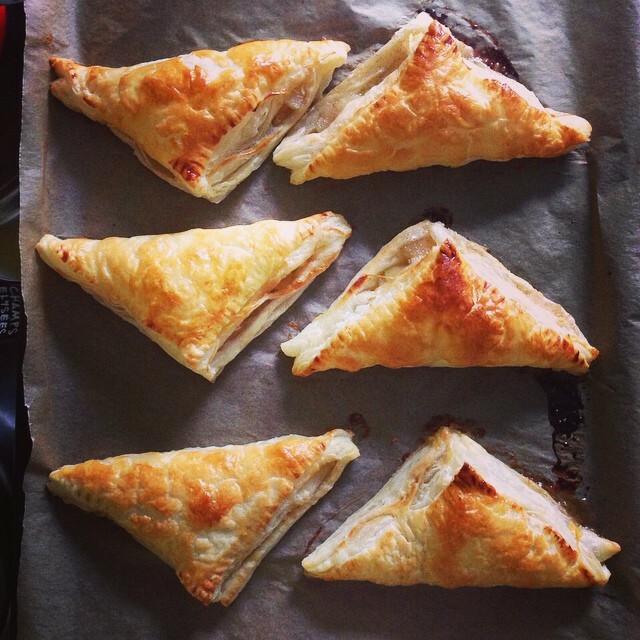 Cut the puff pastry into 6 squares. In a saucepan over medium heat melt the butter and add the apples. Let them simmer a while, then add the sugar. Once you add the sugar the apples will start releasing their juices. Mix them around a little with a spoon, and simmer till the juice starts to thicken. Then add the cinnamon and nutmeg. At this point taste the juice. If it’s very sour add more sugar, but you want it to be a little tangy. Let the mixture cool. Then evenly divide it between the 6 squares of pastry, placing the mix on one half side, keeping in mind you want to fold opposite corners to make a triangle. Fold over the pastry and seal the edges with a fork. That makes them look pretty and ensures that they don’t just pop open once they’re in a scorching oven. Once they’re all sealed place them on a baking tray that is lined with baking paper. Beat the egg with the water and brush the turnovers with the egg wash, making sure you just brush the tops. Don’t let the egg spill over the sides, because then the edges won’t puff up like they should. Bake them in the middle shelf for 8-10 minutes, or until they have puffed up and are golden brown, like in the picture above. Then it’s just a matter of eating them warm, for breakfast, or with ice cream for dessert.